Have you heard of fat bombs? Not the kind of fat bomb I’m talking about! (Even though I love anything drenched in olive oil). 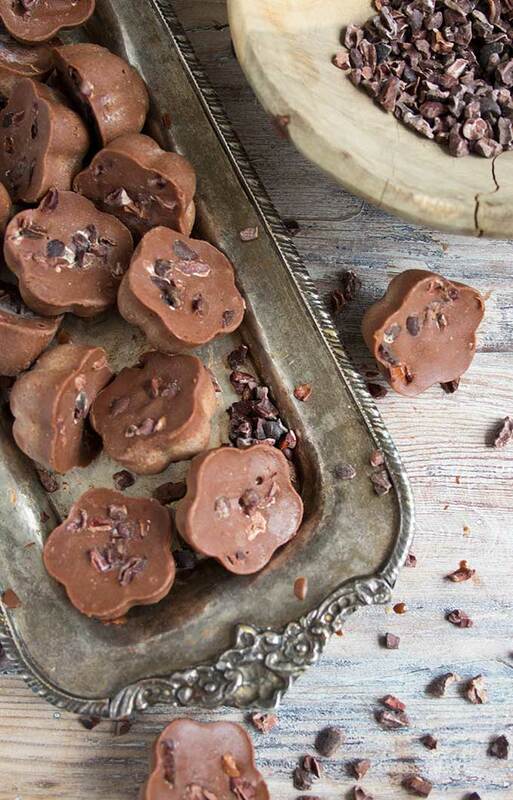 Fat bombs are wonderful little morsels you treat yourself with when you feel like a little energy boost. They are the secret weapon for anyone on a low carb or ketogenic diet. 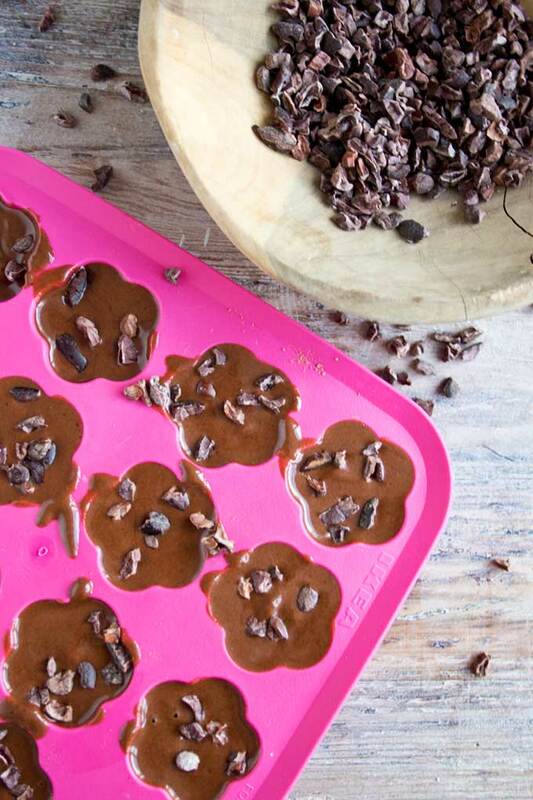 Like these delicious Cacao nut butter fat bombs! I have to admit, when I first heard about fat bombs, the idea of eating something by that name did not entice me at all. Why would anyone want to eat a bite of pure fat? Wouldn’t that make you, well, fat? Turns out, the opposite is true. If you cut out the sugar and white carbs and follow a low carb diet, healthy fats such as olive oil, coconut oil, avocado or nuts are a fantastic source of energy for your body. Eating fat AND sugar together is the lethal combination that WILL make you put on weight. Fat alongside fibre and protein? Happy days. 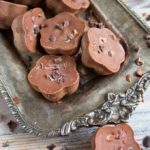 Cacao nut butter fat bombs are not only super easy to make, they are real super food powerhouses. Why? I used cacao powder over cocoa. Cacao is made by cold-pressing the cacao beans, while cocoa is produced by roasting them. This minimal processing preserves all the incredible health benefits of cacao. It’s rich in nutrients – one of the best plant-based sources of magnesium and iron – and contains 40 times more antioxidants than blueberries. It’s also known to be a mood enhancer, regulates insulin levels and lowers blood pressure. The downside is that it is a bit more pricey than cocoa powder, but one pack lasts ages… and it tastes great. I know. I have waxed lyrical about coconut oil before. It is one of the richest sources of saturated fats, but cannot be compared to, say, pork fat. The fatty acids in coconut oil are medium chain triglycerides (MCTs), which are metabolised differently by the body – they are converted into immediately available energy rather than being stored long-term. When you buy coconut oil, choose an organic, virgin oil and not the refined stuff. I used this oil, which is available in the UK – if you are based elsewhere, you can find good oils in your health food store or on Amazon. Whether it’s peanut butter, almond butter or walnut butter – nut butters do not only taste great, but are packed with nutrients. Make sure you get a nut butter which contains the only ingredient it truly needs: nuts. No palm oil, no sugar, no salt. In the UK, brands like Biona and Meridian are good options. This recipe is easy to make and easy to customise. You can play around with the amount of cacao powder – I like an intense chocolate taste, so used 3 tbsp of cacao for my fat bombs. You could start with 2 tablespoons and take it from there. If you use cinnamon as well, using less cacao will bring out the taste of the cinnamon. Also entirely optional is the type of nut butter you use. I had almond butter in my cupboard – but if you don’t, just use peanut butter, walnut butter or even tahini (in the case of tahini, you might want to decrease the amount as I find it’s quite strong in taste). I don’t like my sweets very sweet – therefore, one teaspoon of sweetener is plenty for me. Taste your mix and adjust to your liking! A quick word about the cream: I have made several versions of these cacao nut butter bombs, using mascarpone (very nice) and cream cheese (not convinced) instead of cream. In another try I used only coconut oil and no cream, which tasted good to me, but did not go down too well with the rest of the family. I guess the cream makes it taste more like dark chocolate you can buy in shops. I really hope you’ll make a batch soon – and let me know which variation you went for! If you like the idea of little yummy morsels, you could also try sugar free pistachio chocolates, chocolate peanut butter freezer fudge or my matcha latte chocolates. Melt the coconut oil in a pan or in the microwave. Pour the mixture into moulds or an ice cube tray. Place in the freezer for 10 minutes until the top is set. Sprinkle over the cacao nibs or chopped nuts. Press out of moulds and store in the fridge or, like I do, in the freezer. My mix made 16 fat bombs at 9g each. I'd say they can be eaten in 2-3 bites. How many your mix yields will depend on the size of your moulds. If you do not have a silicone mould, you can line a tray with baking paper and pour the mix in there. 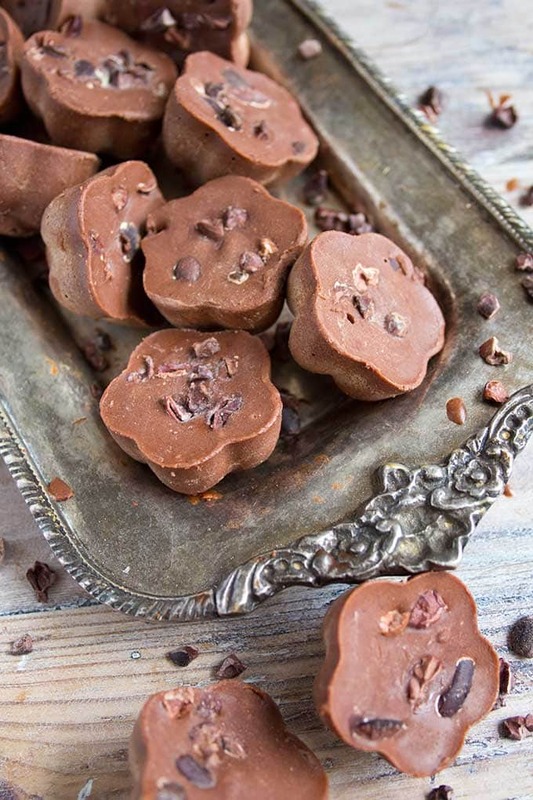 I have done this with my peanut butter freezer fudge (link is in the text above). When the mix has firmed up, you just cut into small squares. Your blog is my new best friend 🙂 I have just made these, substituting organic natural yoghurt for the double cream and about three tbsp of a vanilla stevia coffee syrup Ocado carries for the stevia drops (only downside: potassium sorbate in it). Tasted wonderful going into the ice cube tray! Looking forward to my evening sweet craving tonight! I’d like to make these, look YUM!! I’d like to make them non dairy. Do you sub double cream with coconut cream? Yes, that should work well. Let me know how they turned out! If we substitute granules in place of liquid sweetener how much should we use? Hi Katrin just what I was looking for used coconut cream and added 50g of chopped cashew. Just started the keto diet so hard to find sugar free low carb recipes. The heavy cream seperated from the coconut oil before I even mangaged to put it in the moulds. After mixing all of the ingredients nicely together it took just a few seconds for the oil to seperate. Any idea why? It’s impossible to use it that way. Hi Anne, this has never happened to me before, and I have used a cream/coconut oil mix or a coconut cream/coconut oil in many different recipes. How strange! I have no possible explanation. Maybe the heavy cream was cold out of the fridge, and when added to warmed/melted coconut oil, caused coconut oil to harden a bit, thus not allowing incorporation of cream? Ok, 4th 1 down…thank god fat stops you eating unlike addictive carbs, phew. Looks like an awesome recipe and will be trying today! I avoid processed foods and sugars as much as possible and my two year doesn’t know what sugar is! However it being made with such great ingredients it’s something she can try, so, thanks! Ps, I too dream of Ibiza! Went they last year (twice) and I haven stopped dreaming of it since…. Can you use an unflavored MCT oil of choice instead of Coconut oil? Or is using the coconut oil is for the flavor building? What can I use to substitute the coconut oil, I am allergic to it? You could try cacao butter maybe? I think it tastes delicious and it would work with the flavours of the recipe. Not sure if replacing with another oil would be a good idea – they all have their individual taste. Or try using unsalted butter. What about MCT oil instead of coconut oil? Looks delicious! I look forward to trying this recipe for the holidays, as I watch the kids eat their chocolate Santas……. ;) Would you be willing to share the information about the silicon moulds that you use? I know this is a silly question, but I’m assuming these are ok whilst on Atkins, Lo Carb, no sugar, hi fat… they look incredible!!! Ok, I’ve enjoyed them so much, I forgot to comment. I haven’t made a lot of fat bombs yet, but these are by far my favorite. So good!!! Oh my god! I’m already drooling just looking at the pictures! And its low carb and sugar free too. Which means its guilt free as well. Just made these as above and yum!It’s my 7th day of being sugar free and I just wanted a little pick me up and these are just perfect. Thank You! You are so welcome! I’m glad you like them. Good luck with your sugar free journey. If you’ve managed a week already you’re over the worst!! I made them tonight, and they’re about my 5th try with fatbombs. Thanks so, so much for sharing this. Really helpful for a foodie like me, who is now no-sugar/high fat/low carb. So glad you liked them!!!! It took me a while to get there. I still have a bunch in the freezer, which I am slowly working my way through! As a Type 2 diabetic I have to say that this recipe looks like a good solution for a sweet craving. You really are helping people out there. Keep on posting! Thank you Lisa, that is so good to hear. Hope you’ll try out this recipe! Love the look of these. I wish I could eat one right off my screen! Haha, I know that feeling! 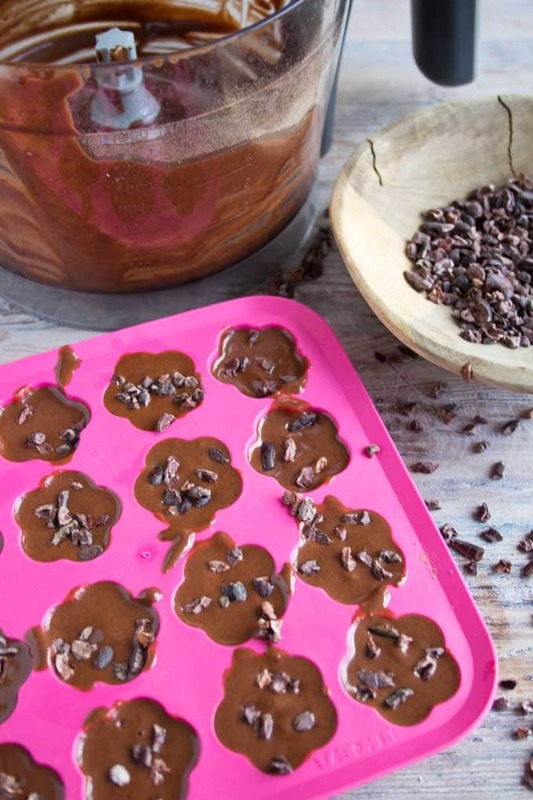 The good news is that these fat bombs are quick and easy to make – and a batch will last you quite a while too! Great news! Let me know how you got on. I always thought cacao and cocoa were the same thing. Thanks for explaining the difference! Awesome recipe! Just made them, they are delicious. THe only tough thing is not to eat them all at once! So happy you like them Susannah! I love easy recipes that ARE actually easy like this one …cant wait to make them.